Founded in 2008, Carolina Compounding is not your typical pharmacy. We have the ability to custom compound medications either for you or your pet. CCNP has a certified state-of-the-art U.S. Pharmacopeia <795> compliant compounding lab that is independently inspected and certified to ensure the best possible conditions for compounding. Our staff is professionally trained and continues to update their skills and knowledge base. In preparation of our products, we only use pharmaceutical grade chemicals from FDA approved facilities. In addition, CCNP via membership of Professional Compounding Centers of America (PCCA) has access to a support network of highly regarded and academically decorated pharmacy consultants for problem solving compounding issues and to remain current on the latest scientific developments as well as being accredited by the Pharmacy Compounding Accreditation Board (PCAB). Since we are a custom-only compounding pharmacy, all of our focus, energy, and efforts go into preparing the highest quality compounded medications. Our staff strives to exceed your expectations. Let us know how we are doing. We thank you for your business in advance and we look forward to providing our services to you for years to come! Did you know we are the only PCAB Accredited Compounding pharmacy in Mecklenburg County and the entire Charlotte Metro Area? Our Commitment To Excellence is second to none. 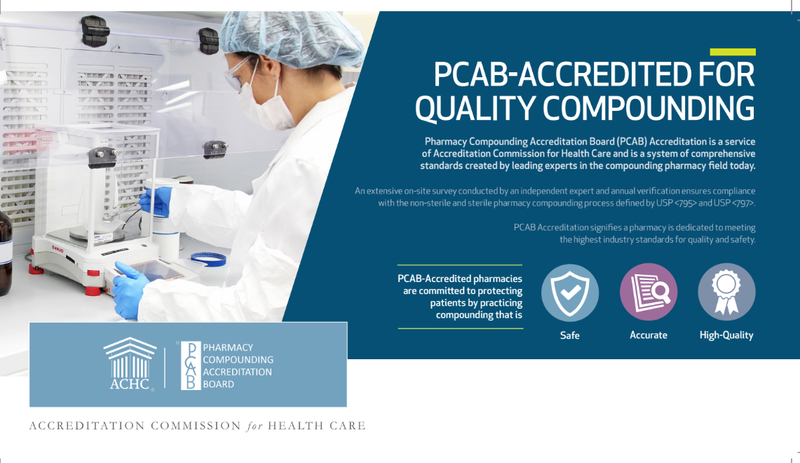 PCAB (Pharmacy Compounding Accreditation Board) accreditation is awarded in recognition of Carolina Compounding and Nutritional Pharmacy’s commitment to meeting and/or exceeding national quality standards. PCAB reflects the organization’s dedication and commitment to meeting national standards that facilitate a higher level of performance as well as patient care. An assessment of the pharmacy’s system for assuring and maintaining staff competency. A review of facilities and equipment. Review of records and procedures required to prepare quality compounded medications. Verification that CCNP uses ingredients from FDA registered and or licensed sources. Review of CCNP’s Quality Assurance program for testing compounded preparations.